Since every drawing is unique, I explained the techniques I used. It's up to you to practice them, yay! You know... sometimes it makes me wonder why I keep posting tutorials since there are still a couple of people out there who say "I give people false hope" or "everything's fake anyway". But when I read all the comments of fellow artists, e-mails of art students or people who just happened to come across my gallery and private notes of people who are happy to see my tutorials and find them really useful, I just melt! And you know what? Even some art teachers are using my tutorials for school assignments after they've asked for my permission, lol! Have fun everyone and keep up the good work! If there are any questions left, please feel free to note me about it! Pleaaase don’t stop tutorials. You are amazing for ding this. Tytyty!!! Thank your so much for this! I tried out the mirror and the shapes technique and they've been incredibly helpful! I believe talent (in art) is only the ability to enjoy the long processes involved in making art. Your work is beautiful and your tutorials are incredibly helpful. Thank you so much for your time and patience, you have a passion that is contagious. I am musing to myself about your tutorials and how even here people think you are talented. I say I use Free hand and lining, but I also use one similar to the shape method you describe and one other that isnt on here, and that is called Boxing in. Maybe we could swap Ideas sometime. I really enjoy your drawings. Anyways, Even with a proven method and practice people still refer to your hard work as talent. Do we call a doctor talented when s/he learns to keep a steady hand and has spent years learning his/her craft? I sure hope not because my life may well be in his/her hands. But with artist, I keep getting told its a talent...I wonder why that is? Great tutorial thank you so much for sharing your knowledge and skills. I find your tutorials very interesting. Sorry to read your note that people leave bad comments. These type of drawings take commitment, patience, effort and practice. You also don't claim they people can draw such brilliant pictures straight away. so that is NOT false hope. They also have the option to leave your page and search elsewhere. Please don't give up! I'm positive many, many, many, MANY more people will support you and I hope this message gives you some hope that people out there do appreciate your efforts!!!! you are so amazingly talented and helpful! thank you so much! Nicolien, I was checking out some of David Desbois work and it was a tutorial on shading and proportion (all that color and layers! don't know how he does it!) I'll stick with my pencils for another decade or so. Anyway, he refereced your tutorial with a link, which I thought was really cool and besides I spent a day downloading and faving all of your tutorials awhile back. Studying every one and of course overloading my brain with too much info! Some how, I missed this one! This is so great! I love how you discussed these five techniques together. I had seen the grid idea mentioned and used it on a few drawings and after kinda altering that technique to save time I always wondered, am I doing things correctly? I love your tips at the bottom, they are so valuable and this now gives me a complete set of Tutorials by you! Thank you so much for giving to others. This is a lot of help thanks so much! i do it too! the mirroring i mean... thanks for sharing! Thank you, you are very kind and very generous indeed. This is very interesting! Personally I have never used anything but the freehand technique. I am self taught, perhaps that's the reason. I tried using a grid two years ago, but found it impossible to work with, erased it and finished the drawing freehand haha. I never start with the eyes though. In fact, they're the last thing I draw. I start with the jaw, then mouth, nose, eyesbrows, hair and then eyes (outlines only on all of those). But most people do start with the eyes, I think. Anyway, thanks for sharing! "My Katie drawing doesn't look okay anymore after it's mirrored"
Yeah, and I'm not a human being. If I could draw your mirrored Katie, I would have accomplished my goal in life. I'm really happy I happened upon this tutorial. I knew the grid technique, but I never had much patience to draw straight lines. At first I was just doing freehand, but I never was totally happy with the proportions. Then I started doing a mix of lines (2) and shapes (3), and now I know that those are actual techniques. I do a lot of measuring with my pencil (or whatever I'm using), too, to compare the reference with my drawing. very strange world^^ you are awesome ! Thanks a lot!!!! great tutorial!!! for over 20 years i have drawn with nothing but FREE HAND! i get extremely frustrated and i'm glad there are plenty of better ways and i won't be considered a cheater. In my mind i always felt bad about doing it that way. i can't explain it at this moment. But i will be using all these techniques going forward and many others i see online. thanks for posting this. I see a myself entering a new level. Thank you so much for this, I'll definitely be using this tutorial to improve myself! Mirroring is always useful gives fresh look, so you can see mistakes right away! But for proportions. Your Gallery is mindblowing!! Love realistic drawings and you are as close to perfect as I have seen! Your attention to detail is impeccable! All the very best to you for a creative lifetime ahead! Your tutorials are all amazing! Thanks a lot for sharing! I am trying to get back into drawing full time after a really long hiatus and you give me impetus to want to try harder Thank You!! Thanks, this will help me alot. Wonderful tutorial! Been trying to work on my people for a while now.. that way I don't look like a total people noob in art class next year. Oh, this is so useful, thank you so much! And it was frustrating until i saw that it's not cheating if you use some help and this (your tut) is exactly what i needed. Thank you! Thank you, your tutorials are a great help and your work is exquisite! thank you a lot, this helps me a lot, right now Im trying to draw a portrait of a baby and his mother as accurately as I can but it is really hard...I just did the sketch and then I went damn how do I continue. Oh i have so many problems with proportions this will be so helpful. Thanks for creating it. 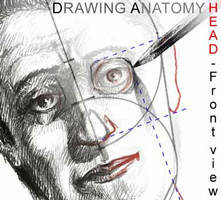 Thanks for sharing your knowledge... Now my drawings are going to improve! Your work is beautiful and very inspiring. Even though I've been trying to learn digital painting, looking at your tutorials and your super-refined pencil artwork has been significantly helpful to me. Thank you so much for taking the time to make and post tutorials. I bet many people who have reached your level of skill wouldn't bother taking the huge amount of time that it takes to help others. So I have to say I really appreciate it! These tutorials are extremely helpful. It didn't cross my mind that someone might complain. That's just silly. You're not giving false hope, but tools to make us better artists. really surprised to see people having any sort of complaints about your tutorials! I think they're fantastic! thanks for posting them!